Traditionally made of blued steel and oiled American walnut. These big bore rifles are not oversized, overweight, disproportioned, awkward rifles. Their essence is of a modern, center fire hunting rifle. Millions of hunters use this style of rifle successfully every hunting season and that is why I have patterned my rifles after this well proven design. Approximately 7-1/2 lbs., plus or minus 4 oz. due to the density of the walnut, and with a 25 inch barrel it is 42-1/2" overall. The .308 & .50 cal. rifles operate on high pressure air, 3,000psi. They can be filled from a scuba tank, airgun hand pump or high pressure (3,000psi) compressor. affordable price, but if I have a higher grade stock, I will offer it. polish to a fine enough finish. I don't take deposits or any money up front. I only accept payment when your rifle is finished and ready to be delivered. The Brigand shoots a .375 lead ball, the size used in .36 cap and ball revolvers; the ball is made by Speer/Hornady or cast on your own. The Brigand is able to be charged with either CO2 or air (at 1400-1600 p.s.i.). CO2 power with an 84-grain lead ball is 600-650 f.p.s. and 67-80 ft.-lbs. The ball proved to be accurate because the barrel was made with a gain twist and choked muzzle. Operating on CO2 at about 60 ft.-lbs., you get 10-12 shots per fill. You can hunt any small game with certainty. Dispatch a feral dog without a second shot. Or at 40 yards make soda cans fly through the air. The big round ball really makes them move. Then, really impress your buddies-run the pressure on air. You can get over 800 f.p.s., which is 120 ft.-lbs. At this power level, you break standard targets and blast through plywood backstops. Be careful! The Brigand was tested by The Airgun Letter in the Dec. '97 issue. At that time, the rifle sold for $385. Then there is independence. With a ball mold, you can cast your own projectiles; and with the pump (see accessories section), you have your own power source. You need not depend on anyone else. The Brigand was first built in 1995 in response to the poor quality of imported big bore guns. I was at the Baldwinsville airgun show when a fellow I know purchased a Philippine-made .380 air rifle. When first charged, the rifle leaked at the inlet. The inlet was unscrewed for repair, and its surprisingly poor construction was evident. The inlet check valve was made from a nail. The nail shank was cut off about 3/16 below the head, and an O-ring was rolled over the cut-off shank. This was the inlet valve, the stock was poor and the barrel was smoothbore. I knew I could do better than that, and the Brigand was born. The Brigand's demise was that it was a CO2 rifle. Now, there was an air rifle suitable for hunting, but in many areas of the country hunting is done in cold weather. The need for a hunting rifle to work in cold weather could only be met by the use of pre-charging. Its success was eclipsed by new requirements. The Rogue is a .44 cal. (.445) pre-charge 3000 p.s.i. rifle. The ball weighs 130 grains, goes 800 f.p.s. and produces 184 ft.-lbs. The Rogue was the next step after the .375, but I had then built a .50 cal. airgun and the .50 was superior to the .44 so I dropped it and concentrated on the .50. The Rogue has been discontinued in favor of the Bandit and is currently out of production. A real world comparison of the size of these airguns. On the left is a Mauser rifle with a 24" barrel in .22/250 cal. To its right, in the first picture, is a 25" barrel .50 Bandit and in the second photo is a 20" barrel .308 Exile. The 20" barrel Exile is a special order item, it normally comes with a 25" barrel. I've included a yard stick to give perspective. I dislike photos with no reference for perspective or such a tight crop that you don't see the whole item. The Bandit is a .50 cal. (.495) pre-charge 3000 p.s.i. rifle. The ball weighs 180 grains, goes 790 f.p.s. and produces 250 ft.-lbs. This rifle was intended for use hunting white tail deer and boar. Projectiles, such as the 180 gr. lead ball, have sufficient mass for hunting deer and boar. Rather than making the projectile heavier just for energy's sake, it is better to raise the velocity for a flatter trajectory. Game do not always appear at even increments of distance, or at your exact sight-in range, so the flatter trajectory is an advantage. If you're shooting from a bench at a known and fixed distance, flat trajectory isn't important. At varying hunting ranges it is very important. All rifles are hot salt bath blued steel with a hand rubbed oil finished American walnut stock. The Bandit has been discontinued and is currently out of production. The Knave was a .25 cal. rifle. 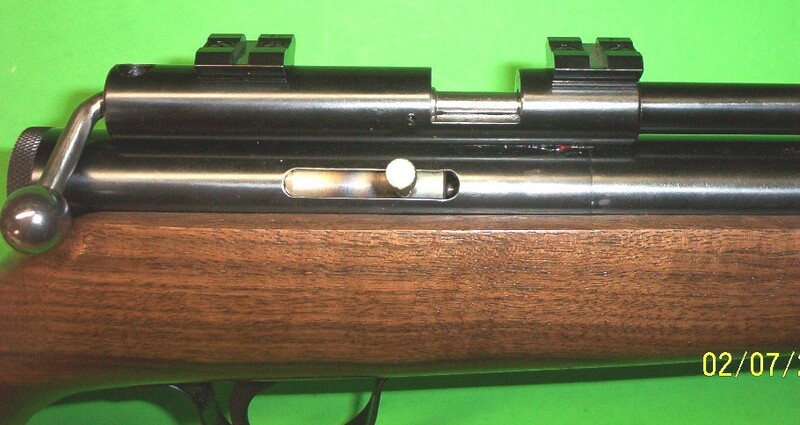 The rifling twist was made so the rifle could handle the heavier 27-32 gr. pellets. This rifle was capable of launching the 27 gr. pellet nearly 1200 f.p.s. At this velocity, the pellets wouldn't group 1" at 100 yards. Accuracy was made right by detuning the rifle (to under 900f.p.s.) for use with pellets or to use solid projectiles by using cast lead firearms bullets. This wasn't due to the rifling twist, for I tried different twist rates to make sure. I believe that the air blast was so powerful that it distorted the pellet's skirt. This is another case of not standing still, I was experimenting with a .308 cal. and the .308 caliber's performance was head and shoulders above the .25's. The .25 was discontinued in favor of the .308. The Exile has a .308 bore, pre-charge 3000 p.s.i. rifle. .308 is the standard 30 cal., not an oddball size. It uses commercially made 30 M-1 Carbine cast lead, round nose bullets. 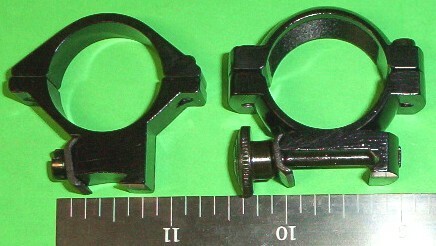 They are available from bullet casters in lots of 500 for $16. to $18.50, plus shipping. Or you can buy a ready made bullet mold for $16. to $18. 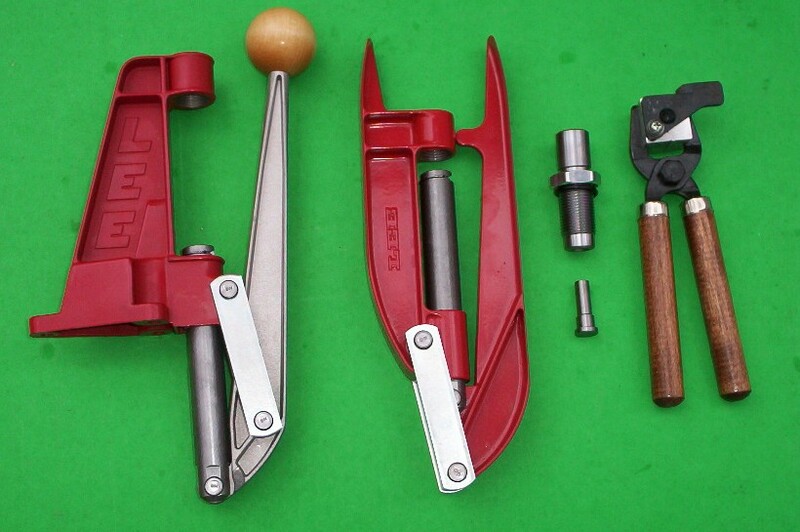 from Lee Precision, or from others (RCBS, Lyman, SECO, etc.) for somewhat more money. The bullets for this rifle are 115 or 130 grains at over 850 f.p.s. which will be 200 ft.-lbs. This rifle was made for longer range shooting such as fox, coyotes, groundhogs, etc., where you don't need as much power as the .50 but you need more range. The higher velocity and aerodynamic shape of the bullet gives a flatter trajectory, so you don't have to use as much hold over at longer ranges. Knave .25: 10 Over 1200 Outlaws have now been made. Currently made rifles, both .308 & .50 cal., have Weaver scope bases rather than the 3/8" dovetail. Weaver bases are the type that are used on center fire rifles. The standard rifle I make is right handed. I can make left handed rifles (putting the machine cuts on left side or the right side is the same amount of work, so I don't charge extra for it) but you just need to tell me at the time of ordering so I can machine the parts for left hand. It has a genuine left hand stock too (a mirror image of the right hand stock). Ownership Ageement: A form will be sent to you when you order a rifle. It contains safety rules and other gun handling practices. These rifles are more powerful than other airguns, and I will not sell them to anyone who does not know how to use them safely. The form is required to be read, acknowledged and signed. When returned, your rifle will be shipped. No signature, no sale. Quackenbush Airguns are made with industry standard sized barrels. So, widely distributed, off the shelf (therefore inexpensive) bullet making and sizing equipment can be gotten. Lee reloading equipment can be used for the Outlaw rifles. On the left is a reloading press that mounts to a bench. The bullet sizing die is threaded into the top of it and a plug, to push the bullet, is put in the ram. Moving the handle, with its increased toggle link leverage, will easily push the bullet through the sizer die. The next item over is a hand press. It does the same thing, but you use it as a nut cracker way. It is not mounted to a bench and can be used anywhere. Third item from the left, is a sizing die. The die itself is threaded into the top of the press and the item below it is the plug that goes into the ram of the press. The item on the right is a bullet mold. It comes complete with the wooden handles. For .308 Lee #90364 is a 120gr. bullet; #90365 is a 130gr. bullet. For .45 pistol Lee #90347 is a 190gr. bullet. For .45 rifle Lee #90373 is a 340gr. bullet. For .50 Lee #90449 is a .495 diameter round ball. These molds are available from mail order gun supply and your local gun shop.